Here is a collection of some of my random thoughts within 24 hours of arriving in Pakistan for a visit. Do you remember that moment when you arrive in Pakistan? Can you relate to these other random thoughts? People forget how to make lines the moment they enter the gate for the flight to Pakistan. 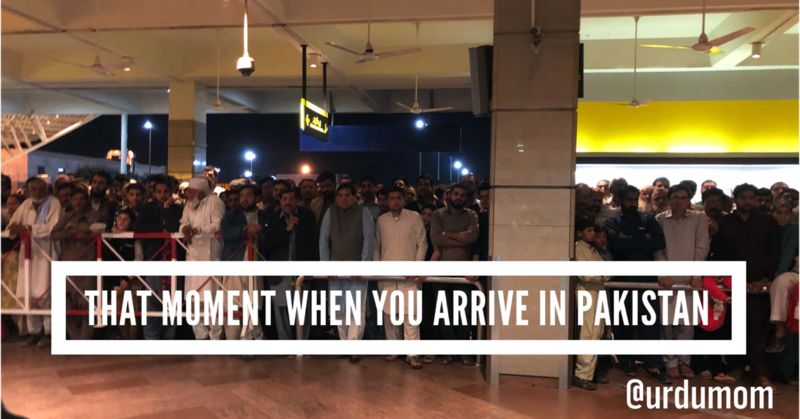 That moment when the plane lands in Pakistan…and people can’t wait to get off (even before the plane has stopped moving). The air hostess tires of her protests but the people don’t give up. You realize how everyone stares in Pakistan: leery men, regular men, women, elderly, even the children. You haven’t noticed how fat, kamzoor (thin), tall or short you have become, till you land in Pakistan and are reminded of this by every distant acquaintance and your mother’s maid. You realize how every one is either in a traffic-rule breaking hurry or in a slow I-have-nowhere-to-go trance. You think to yourself: “how did I ever survive without house help, can I smuggle one of them back”? Then you realize it takes longer to explain something and is quicker to get it done yourself. You marvel at the abilities of pedestrians to cross the road at the peril of their lives, every single time. Life seems like one big party compared to your scheduled life back in the West. You fall in love again with the sound of the Azaan. You love the soundtrack of life in Pakistan with the sounds from the street vendors, the chirping of the birds and the voice of your mom on the phone in the room next door. These are reactions of course in the first 24 hours as you settle in during your visit to Pakistan. The feelings and emotions change over the days of the visit. I shall keep reporting mine! Can you relate to these thoughts? How you have to call all the relatives to let them know you are there! (Just in case they haven’t heard by now!). Then meeting ALL of them in the short amount of time you are there. Then they shower you with love and presents and money for the kids (which you debate using for your own last minute jora!). You have no idea how nostalgic this made me feel! Having recently returned myself from a trip to beloved homeland, I can so relate! Loved every bit of this! haha some of these are on-point.